As a cheapo fashionista, I like hosiery – it can change the simplest outfit and adds that critical zush factor. Stop here if you don’t like footless tights – I confess right now I adore the blighters. Wear them inside out. Some tights are pretty cool on the reverse side. I’ve got a pair of red footless tights with white spots and when you wear them inside out they have a cool textured heraldic emblem type shape. Double the value! If your tights go in the toes, or ankles etc, chop them into footless tights. Get them cheap. They often get reduced at the end of the season – there are bargains to be had. Watch out for Farmers – their sale days often include 30% off hosiery and socks. Get experimental. 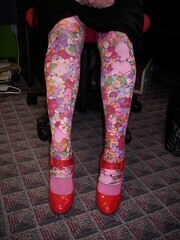 Now that hosiery is in fashion, you can buy some really odd, funky ones – and you don’t have to break the bank. Layer your tights. Coloured opaques under fishnets, two different colours together can create a new unusual shade. I’ve got a pair of gold footless tights that looked a bit sickly – but when I layered a pair of lacey black numbers on top they looked luxe. Clash/match/tone with your clothes and footwear – for all sorts of effects. Don’t be too shy to try. Should I be on wordpress? I’ve figured out how to add piccies…I think I need some blog training from you….also…Happy Birthday baby!! !